A view of Earth's dazzling auroras as seen by astronaut Doug Wheelock on the International Space Station on Sept. 5, 2010. The luminous aurora displays that make up Earth'snorthern lights may get a boost tonight (Sept. 13) from a weekend solar eruption. 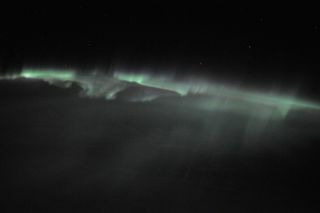 The eruption was a coronal mass ejection that was notaimed directly at Earth but was expected to deliver a glancing blow to Earth'smagnetic field, Spaceweather.com said. It could amplify the aurora displays forskywatchers in parts of Alaska, Canada, Iceland, Greenland and Scandavia, thewebsite added. Coronalmass ejections are huge eruptions of plasma into space.When aimed at Earth, the solar particles stream down the planet's magneticfield lines toward the poles. The Sept. 10 sun eruption was observed by NASA's SolarDynamics Observatory, the agency's twin Stereo spacecraft and the Solar HeliosphericObservatory, all of which are constantly studying the sun. Severe solarstorms can cripple satellites and potentially knock outpower grids on Earth. Friday's coronal mass ejection came two days after anotherpowerfulsolar flare.